‘U.S. Army Hospital Center 804’ tells the story of five U.S. Army hospitals located on the Shropshire/Flintshire border during World War II: Llanerch Panna, Penley, Iscoyd Park, Oteley Deer Park and Halston Hall. They were built by British contractors during 1942-44 and used by American hospital units until the end of the war in Europe. When the American units left the area some of the hospital sites were used by displaced Poles. For a few months at the end of 1944/beginning of 1945 the hospital at Iscoyd Park treated German Prisoners of War. 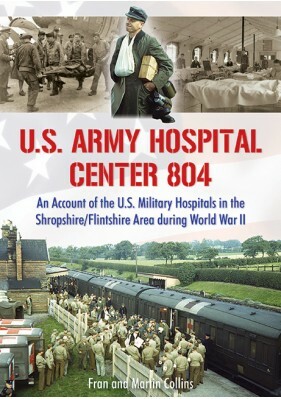 The headquarters of the 5 hospitals – Hospital Center 804 was first located in Gwernheylod (Flintshire) and later moved to Whitchurch (Shropshire). This book looks at the day to day activities at the hospitals using archive material and accounts and previously unpublished photos from those who were there at the time and their relatives. It also looks in depth at the stories of some of the patient-soldiers who passed through the hospitals. It touches on the impact the occupants of the camps and other U.S. camps in the area, had on the surrounding towns, with particular regard to Wrexham in Flintshire.